Lastolite has announced the launch of the new Quad Bracket and Ezybox Quad. 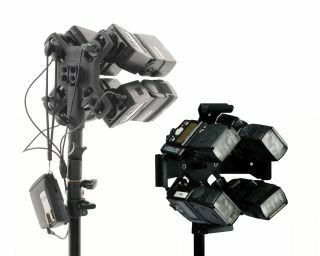 The Quad Bracket is a flashgun bracket that mounts up to four flashguns so they can all be fired at once, to enable either more power or faster recycling times. The bracket enables you to mount up to four flashguns, then attach up to two 8mm or 10mm shaft size umbrellas to diffuse the light. The Quad Bracket can be used in conjunction with various flash trigger systems using one of the accompanying PC cables to connect the flashguns to a single receiver (PC or 3.5mm jack connection). The Quad Bracket is Nikon SB-900 compatible, and is available now for £60. Visit the Lastolite website for more information.